Besides these 4 circuits, by changing the values of the resistors and capacitors, you can change the behaviour of the circuits. For example, in the astable circuit, if you change the resistance values, it works as an Infrared (IR) transmitter and you can use it in remote operated switch circuits. 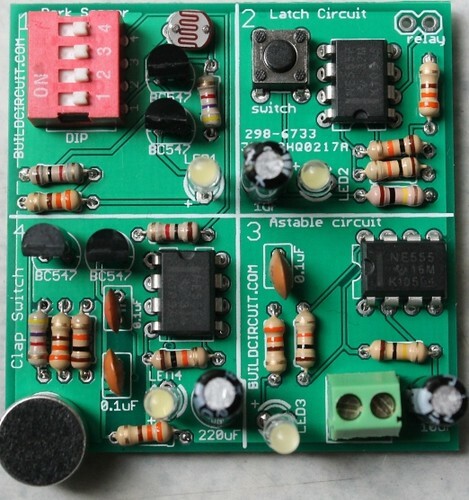 When you buy the kit, the link for schematic of the Infrared transmitter will be provided. However, we don’t ship components for the IR transmitter circuit. Second example, the clap-switch turns on the LED for a while and turns off again, you can change the on-time by simply changing the values of the resistors and capacitors. The instructions links will be provided to the buyers. See all the photos and get idea for making this kit. Video 1- Dark sensor using LDR. Video 2- A latch circuit using NE555 timer. Video 3- Astable circuit using NE555 timer. Video 4- A clap-switch circuit using NE555 timer.